Strings of orange banners festooned the streets of Madurodam Miniature City in The Hague. Flags fluttered in a gentle breeze. The sun shone out of a cornflower blue sky as Madurodam prepared for the World Cup. People lounged in their gardens. One family gathered in front of a wide-screen television put out on the patio. When I passed Madurodam stadium, the match had not started yet. Players and fans were singing the national anthem. On the outskirts of the city, I passed the klompenfabriek, a clog factory. Fifty years ago clog making thrived in the Netherlands; eleven hundred wooden shoe makers produced 3.8 million pairs annually. Today only fifteen factories remain and turn out 800,000 pairs per year. 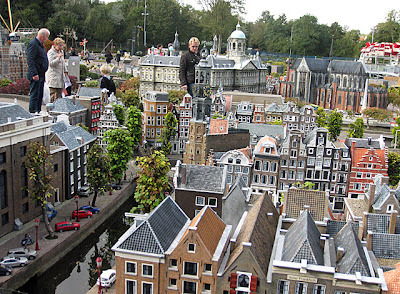 The Madurodam factory is still in full operation. I inserted a euro in the slot machine. A grumble roared inside the building. Seconds later a shining pair of clogs bounced onto a conveyer belt, into a lorry which started moving and stopped right where I stood. I bent down and picked up my miniature pair of clogs. 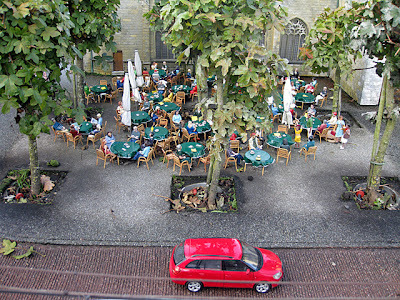 Madurodam is Holland’s smallest city. Its inhabitants live in houses, apartments or farmsteads. In summer they go to the beach or visit the Zoo. There are 4,542 cars and lorries and eight motorways. The city prides itself on ten museums, five train stations, four churches, three theatres, twenty-seven bridges, one post office, fifty-eight ships, one airport, 3,150 lamp posts and 30,000 flower bulbs, mainly tulips. I did not count them but the Madurodam booklet I got at the entrance told me. Madurodam offers a variety of architectural styles, from Gothic St. Jan Basilica to futuristic bridge dwellings, houses spanning the river. The tallest building is 25 m (82 ft) high and houses the Rotterdam Insurance Company. The all-glass façade looked stunning, but good God I thought, it must be a window cleaner's nightmare! 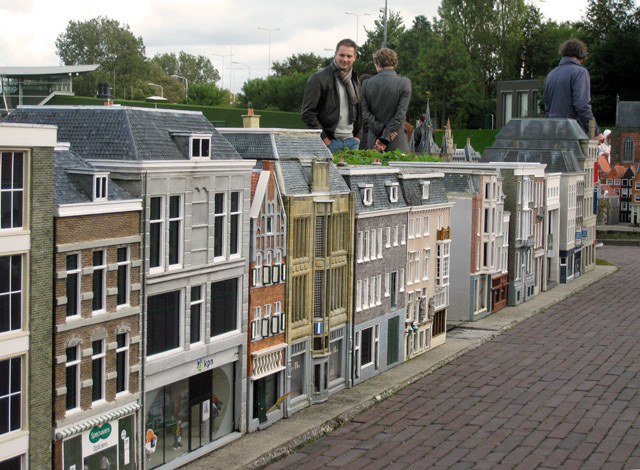 All buildings in Madurodam are on a 1:25 scale. Construction of the buildings and maintaining them is a full time job for thirty-five people. Curaçao-born George Maduro gave his name to the city. He died in action during the Second World War. Madurodam is both a war monument and a charity foundation. The city was founded in 1953. The project was a joint initiative of Mr and Mrs Maduro and Mrs Boon who supported the Dutch Student Sanatorium. Here students could recover from tuberculosis and at the same time continue their studies. Since this was very costly, funds had to be found. Mrs Boon took the English miniature village in Beaconsfield as a blueprint. High revenues enabled the British owner to make regular donations to London hospitals. I can do the same, she must have thought. 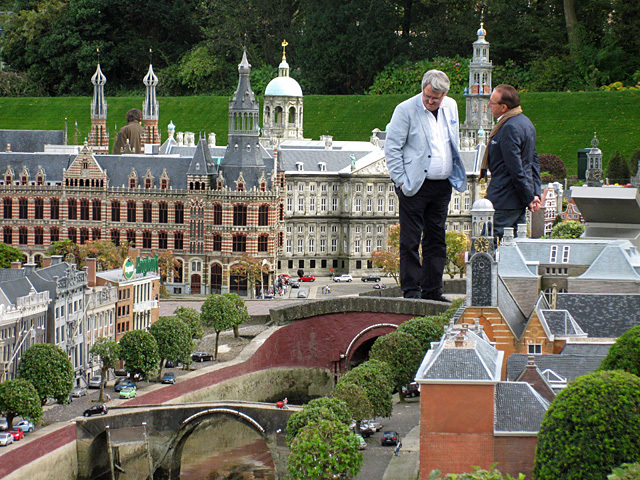 Madurodam finances eighty per cent of the objects. Industries and companies with an affinity to the objects sponsor the remaining twenty. Several airlines have one of their airplanes stationed at the city’s airport, a replica of Schiphol Airport. I found well-known Dutch retail chains and supermarkets in the shopping street. 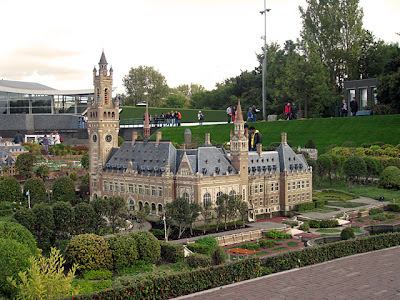 Multinationals have their headquarters in Madurodam. Sponsored buildings and objects must gain approval before planning permission is granted. A building site must be available. The building must be typically Dutch and attractive for visitors. If the commission approves, construction can start. Once the two parties have signed the contract, the building will remain in the city for five years. Every year, companies sponsor one or two new buildings. They first take detailed photos of the original. Then construction starts in Madurodam’s own workshops. Originally all buildings were made of wood, but these days synthetic materials are used because they are weather-proof. Smaller buildings take about three months to complete, but larger, more complicated ones can take as long as three to four years. One of these complicated buildings is the Rijksmuseum in Amsterdam. I looked through the roof windows and saw visitors admiring works of art. The scene looked very much like the real thing. To my big surprise, I found only one hotel; Hotel De Wereld, a four-star hotel in Wageningen, a city in the east of the Netherlands. On 5 May 1945, a Canadian general and a German Commander-in-Chief reached an agreement on the capitulation of Germany. Today the Dutch celebrate Liberation Day on 5 May when special ceremonies take place in Wageningen and Hotel De Wereld. Madurodam Rail was my favourite. I loved to see miniature trains criscross the city. Twelve different types of trains cover four kilometers. All trains are hand-made and replicas of Dutch trains. Every six to ten years, engineers renovate the tracks, just as in the real world. Accidents are rare because Automatic Train Protection System is in force. A train stops automatically when the next stretch has not been cleared. The Nederlandse Spoorwegen, Dutch Rail, uses the same system. If you have visited Amsterdam, you will recognise many sights: Dam Square, the Royal Palace, Anne Frank House, Skinny Bridge, Rijksmuseum and Mint Tower. But also the rest of the Netherlands is represented. A visit to Madurodam is the beginning of an exploration of other Dutch cities. QUICK FACTS: The city walk took me just over an hour. I followed the white arrows on the paths. This meant that I did not lose the way and saw all sights and buildings. Madurodam is open all year round. The most crowded time of year is summer with bus loads of visitors. At sunset, 50,000 light bulbs give the city a magic glow. Winter is equally good, especially when a dusting of snow covers the roofs, parks and streets.